Brian's not much of a champagne drinker so, with New Year's Eve coming, I wanted to make a festive cocktail that didn't rely on the bubbly. A chocolate martini seemed a good choice and I asked him to bring home a bottle of Godiva chocolate liqueur. He bought what I asked for but, as I was mixing the drink, he expressed doubt that it would be good. Well, I consider that a challenge so I set about trying to add more chocolate flavor to my chocolate cocktail. I didn't think a syrup would dissolve properly so I thought about combining cocoa powder and sugar and then realized that exact combination of ingredients was staring at me in my office's pantry in the form of a packet of hot cocoa mix. So, did adding the mix kick up the chocolate flavor? Oh, yeah! Cheers and Happy New Year! Melt the chocolate in a shallow dish and dip a cocktail glass into it until the rim of the glass is coated in chocolate. Set the glass in the freezer for a few minutes to set. Prepare a packet of hot cocoa mix but use only 1/2 cup of boiling water instead of the full cup on the recipe. Make sure the cocoa is completely dissolved and set aside to cool. Once cooled, combine an ounce of the mixture with the vodka, chocolate liqueur and creme de cacao in a cocktail shaker and shake over ice. 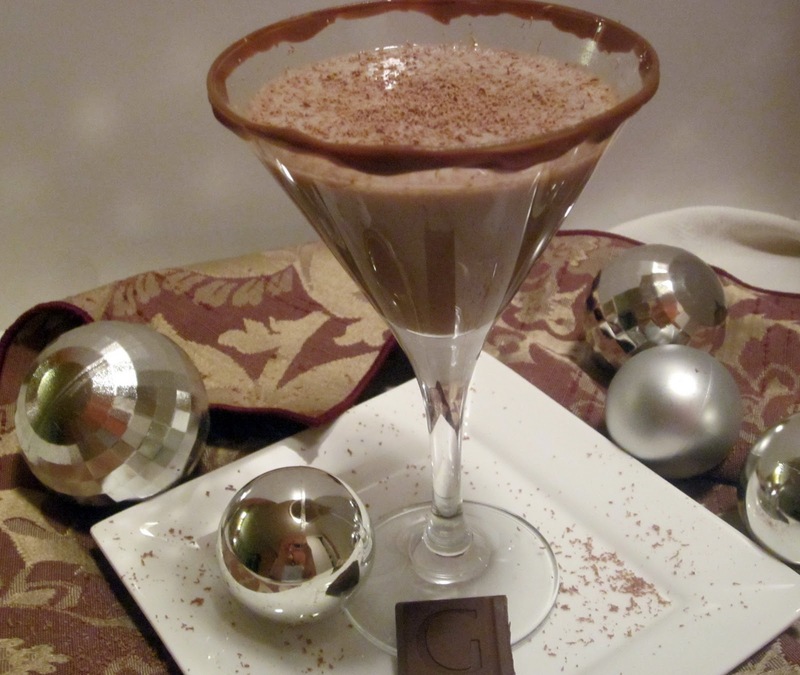 Pour into the chilled cocktail glass and top with the grated chocolate. now that is making my mouth water! Oh wow! This looks incredible! I've always felt like chocolate martinis are a bit thin for my taste as well. Looks like I'll be giving this recipe a try! I used to love a good chocolate martini back in the day (my body doesn't tolerate hard liquor anymore). I never added hot cocoa, which sounds delicious, but I did do the vanilla vodka/choc liqueur combo. You can mix things up by using different flavored vodkas - raspberry, orange, etc. Yummy recipe! OK, next time I'm in the liquor store I'm getting some Godiva liqueur! YUM! Looks fabulous! Can't wait to make some! I have always thought the same way as Brian. People rave about 'Chocolate' drinks and I just don't get it. However, as a chocolate lover, I will definitely be giving your trick a try...very soon. Now that's chocolate-y! Well I too in my opinion will have the same one with your husband if you haven't tweaked it up and boost up it's flavor.